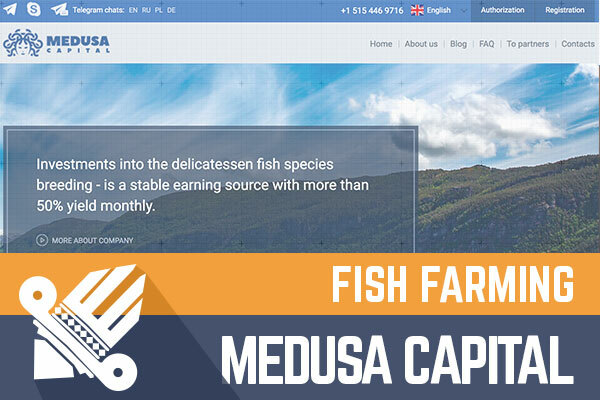 Today my attention was grabbed by one of our latest HYIP’s called Medusa Capital. It’s just that you get used to reading all cryptocurrency and stock trading related HYIP legends that any exception grabs your attention twice as much as any usual HYIP legend. What’s so special about it? Well, it’s a HYIP, which claims to be involved in the fish farming business. Medusa Capital joined the Golden Stage on the DavidNews.com monitor on the 2nd of October. However, admin claims that it’s already 112 days old. Let’s find out how was this HYIP doing previous 3 months. Now I have invested into this HYIP $400 and will inform you about the progress of it. Keep reading to find out more! Do you eat fish? Then there is a very high possibility that you have eaten fish, which has been grown in a fish farm. It doesn’t always mean a bad thing because fish farming just like any other type of farming can be done responsibly without harming the nature or fish we eat. Why people do it? There is a high demand for certain fish and fish farms can guarantee a certain amount of fish being grown. Moreover, you don’t have to go fishing for endless hours without knowing if your nest will be full this time. Medusa Capital on the company biography page has written the following “We are constantly improving and applying a brand-new technologies and production methods during the breeding. The reason is, that we do not want to make our business by both polluting the environment and harming our customers”. Whatever is their real background and long-term goals, I have a feeling that people have done the research and written a proper legend. Sure, the legend is only one side of the coin and it can’t guarantee the safety of deposits. I find also unusual that Medusa Capital has two registered companies for this project. One in the US, but another – in the UK. Most of the HYIP’s register company in the UK because it’s comparably easy and not expensive procedure. Admin has taken credibility aspect very seriously and is trying hard to make website visitors believe that this is really a legit investment. However, we all know that any HYIP is a high-risk investment. You can find out more about the company registration details and the full legend of Medusa Capital on the About us page. The website has 6 language options, but only 4 are active now (English, Russian, German and Polish). Even though the company has been registered in two countries, we see the phone number with the US country code on the website. The good thing is that website is secured by GeoTrust SSL certificate. The overall impression about the website is great. It looks professional, provides an answer to most of the questions potential investor might have, has SSL certificate and is mobile responsive! Moreover, the admin has thought about mobile app fans. Unfortunately, there is an app available only for Android devices. Still, it’s an extra effort for admin, which might be a convenient feature for some investors. In case you would like to get in touch with Medusa Capital, there is a Telegram group, phone number, e-mail address, skype account and online chat box. All things considered, it seems that admin has thought a lot of different ways how to make the website look good and about the end user in general! Let’s move on and find out more about investment plans. Firstly, there are two investment plans. In both plans, min deposit is $10, which makes it affordable for both beginners and pro players. Secondly, the deposit is included in the payments and is not always a bad thing. Big amount of money will not leave the HYIP because the deposit is included in the withdrawals. Of course, it’s not a guarantee that the HYIP will return your deposit and profit. Thirdly, withdrawals are instant, which is not a regular thing for all HYIP’s. Keep in mind that for the plan called Syntoni withdrawal is available only after 10 days, but for Makri – every day. Fourthly, the interest rate for Makri – 5% a day for max 30 days, but for Syntoni – 11% a day for 10 days. On one hand, it’s safer to make a deposit only for 10 days and at the end of the investment, cycle decided if you want to make another investment. On the other hand, you can withdrawal money only at the end of the investment cycle and can lose everything in case it collapses during that cycle. To give you a more concrete example, $200 invested in Makri with 5% daily for max 30 days would make $10 a day and at the end of the investment term would generate a profit of $100. The deposit would reach the break-even point after the day number 20. In case it will collapse earlier than 30 days, you need to reach this point to avoid losses. Same amount of money deposited in Syntoni would make a profit of $20 at the end of the cycle – after 10 days. However, you can withdrawal money only after 10 days and in case of collapse during this time you lose everything. As usual, I tried my best to gather here all most important facts for you. All things considered, it seems a professional website with a strategic marketing approach to attract more investors. We see registration certificates assigned by 2 different countries, android app, well-written legend and SSL certificates. It looks good now with two simple investment plans, but it’s impossible to predict what’s going to happen with it tomorrow. I already wrote a lot about investment plans in the previous paragraph. Remember, I’m not here to tell where to invest, but only gather information for you. Therefore, if you ever decide to make any investments, don’t invest more than you can afford to lose! Did I forget to mention anything important about Medusa Capital that you are aware of? Drop a message in the chat box! Investment plans: 5% daily for 30 days, initial deposit included in the payments. 110% after 10 calendar days, initial deposit included in the payment.